There are eight planets orbiting around the sun in our Solar System and they are categorized into inner and outer planets. Each category is defined by specific planetary features and characteristics which this article aims to list and explain. The inner planets are the planets in our Solar System that lie close to the sun. These planets are Mercury, Venus, Earth, and Mars. Also called terrestrial planets, these planetary bodies are mostly made out of solid materials and various heavy metals such as nickel and iron. Inner planets are relatively small in size and do not have rings. Scientists believe that inner planets were formed out of a massive cloud of gas and dust called a nebula. As the nebula collapsed, most of these materials gathered in the center to form the sun. The rest of the materials rotated and contracted until they flattened into disks called protoplanetary disks. The sun’s radiation swept the light gas away while heavy materials in the protoplanetary disks became planetesimals, which later formed into the inner planets. The inner planets lie within the asteroid belt and are characterized by many land features such as volcanoes, mountains, and craters. As inner planets are composed of rock and heavy metals, they are heavy and dense. These planets rotate slowly on their axis but travel quickly around the sun. 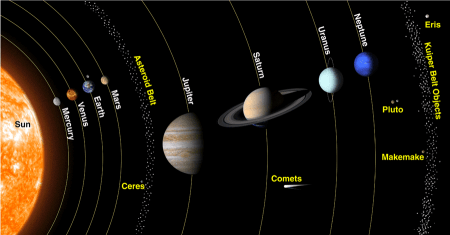 The outer planets are planets in our Solar System that are farther away from the sun. These are Jupiter, Saturn, Uranus, and Neptune. These are the light gases and ice that were swept to the outer part of the protoplanetary disk which formed into the outer planets. Thus, outer planets are mainly composed of gases such as helium and hydrogen. Outer planets are huge, averaging 300,000 miles (480,000 kilometers) in diameter. Although these planets are big, their composition allows them to spin rapidly on their axis. A single day on Jupiter is equivalent to only 10 Earth hours. Because of their distance from the sun, outer planets take longer to orbit around it. For instance, Saturn takes 29 Earth years to circle the sun. The outer planets usually have multiple moons; Jupiter has 63, Saturn has 60, Uranus has 27, and Neptune is known to have 13 orbiting moons. These planets also have rings similar to the rings around Saturn. So what’s the difference between inner and outer planets? The inner planets are planetary bodies in our Solar System that orbit close to the sun. Also referred to as terrestrial planets, these are Mercury, Venus, Earth, and Mars. The outer planets of our Solar System (i.e. Jovian planets) – namely Jupiter, Saturn, Uranus, and Neptune – are the planets that lie farthest from the sun. The inner planets are believed to have come from materials from a collapsed nebula that formed near the sun. Rocks, heavy metals, and other solid materials make up the composition of these inner planets. Other materials such as gas that was swept halfway across the Solar System formed the outer planets. This is the main reason outer planets are mostly made up of gases such as helium hydrogen, and methane. Check out this YouTube clip for more about the inner and outer planets.